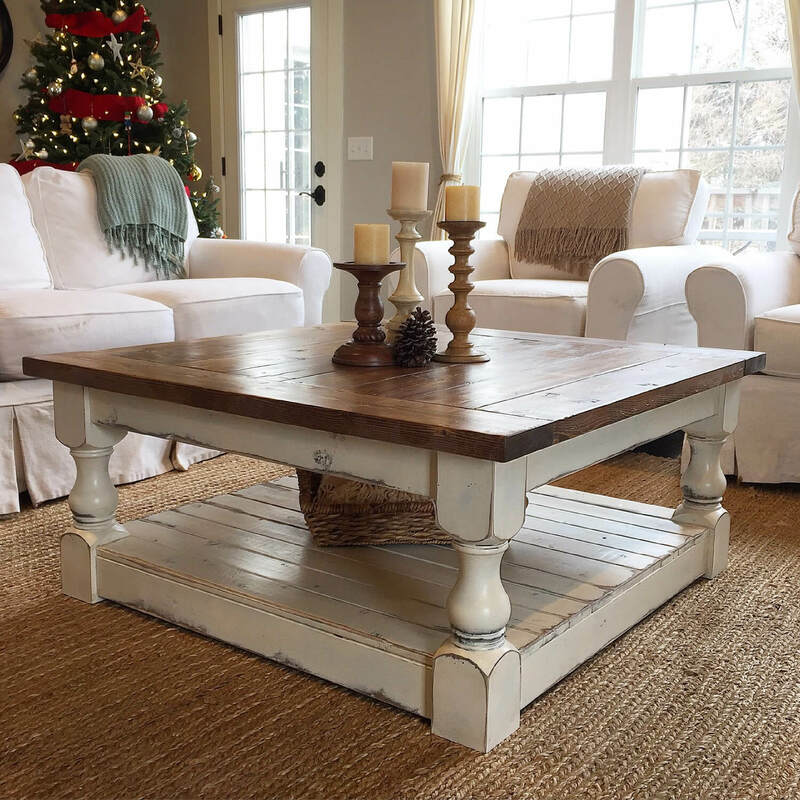 Your coffee table is the anchor of your living room, making a design statement and serving as a visual focal point. It’s also one of the most clutter-prone surfaces in your house. 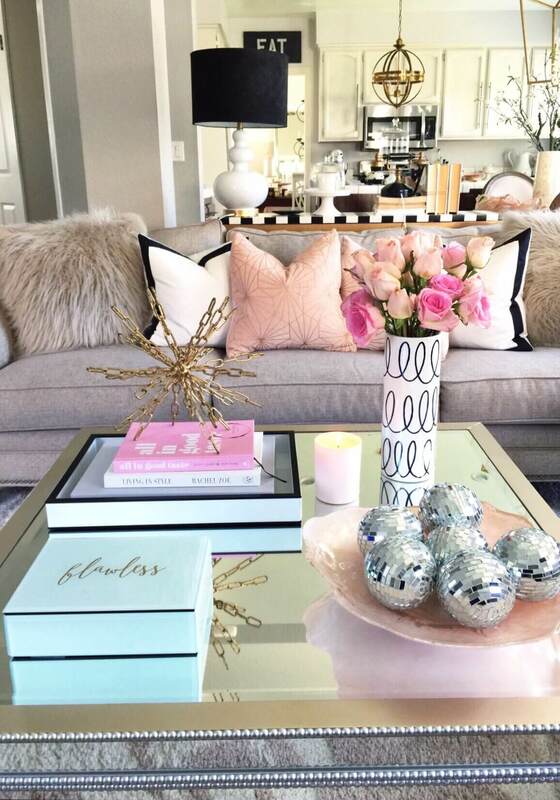 Remote controls, magazines, knick-knacks, mail…if it’s in your hand when you sit down on the couch, chances are it ends up on the coffee table, and “cluttered” is a design statement no one wants to make. One simple remedy? Design with your lifestyle in mind. If you know, you tend to collect catalogs on your coffee table, put a basket underneath it to keep them contained and out of sight. Add a tray to display decorative items and make tidying easy, if it’s not in the tray, put it away! 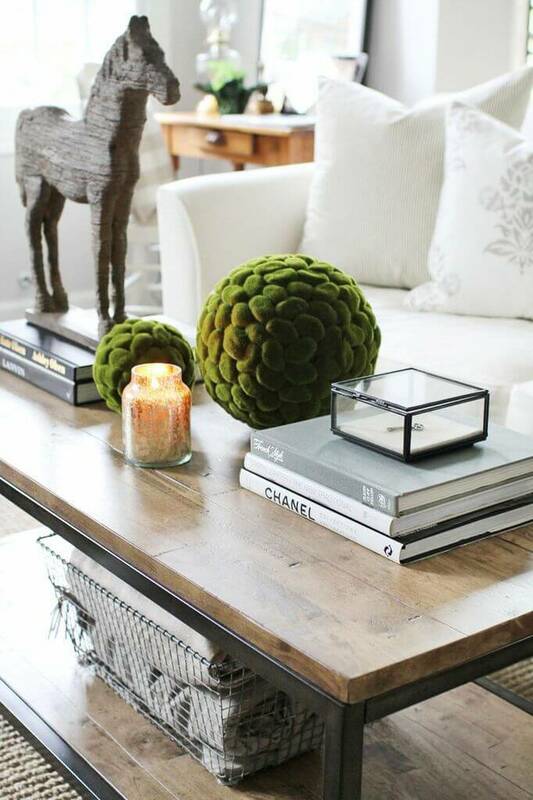 You don’t need expensive artwork to make your coffee table display elegant and chic. A simple vase of flowers or a moss topiary adds an instant pop of color and style, and it’s easy to change with the seasons. 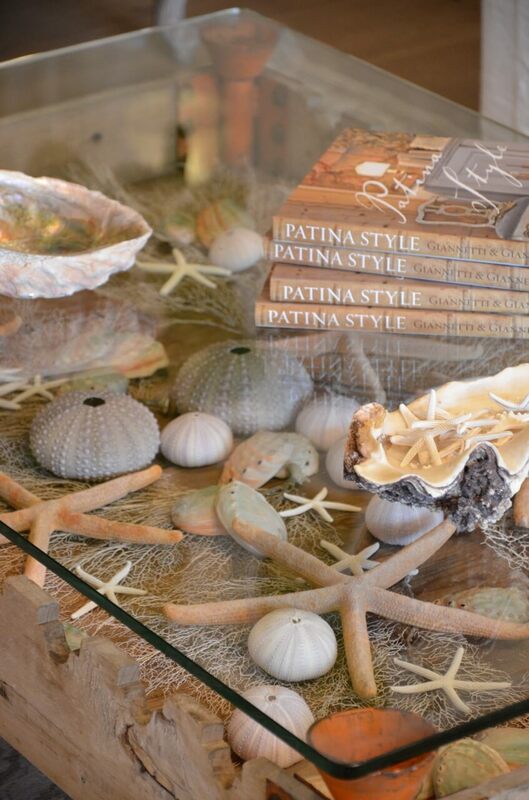 Make a personal design statement by displaying some of your favorite books, or shells from your last family vacation. With a little planning, you can turn that cluttered tabletop into a design feature to be proud of. 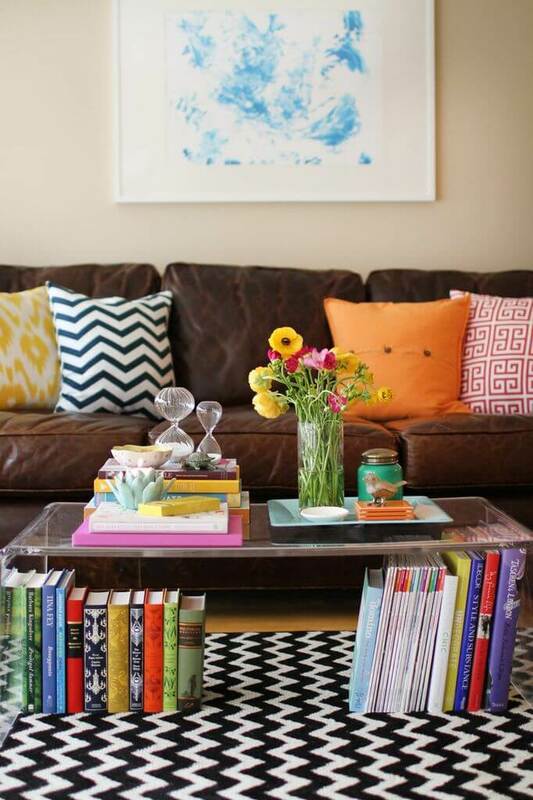 Check out these 37 coffee table decorating ideas to get you started! This is proof that minimalism is not boring! 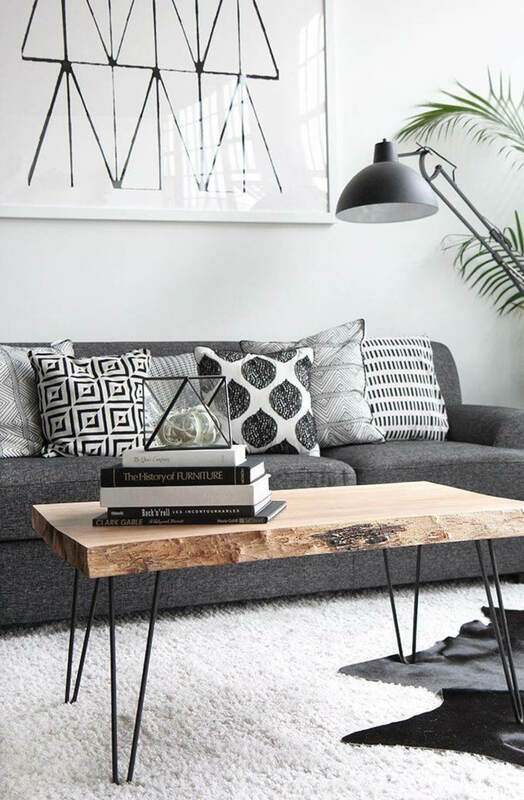 When you have a neutral color scheme like gray and black, lean into it and play with texture. Faceted geometric vases and a large hardcover book add interesting texture without breaking the palette. This leaves room for the bright pop of colorful flowers to take center stage and warm up the space. This ensemble of coffee table toppings is muted in color, yet lively and bright. Shabby-chic ceramics and candlesticks all have lovely patterns and shine. The miniature terrarium lets you peek in to see some beautiful live greenery. Can’t you just smell a warm, yummy fragrance from the candles to round out a lovely sensory experience! Unapologetically fabulous. That’s how we’d sum up this coffee table display. 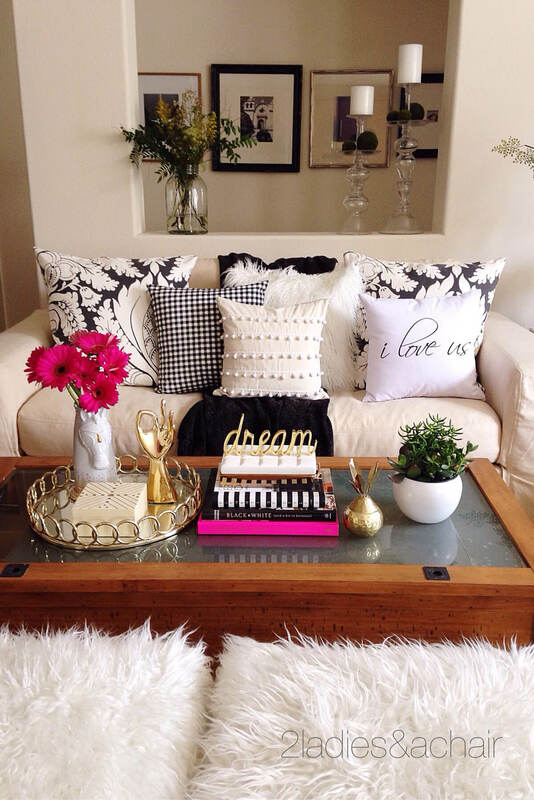 Not to be outdone by the sumptuous and plush couches, the gold accents and pops of fuchsia pull focus. 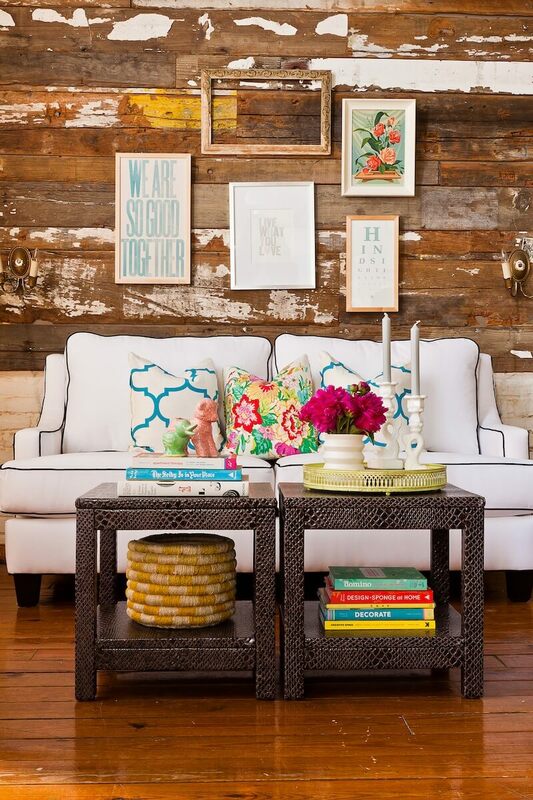 The eclectic colors all work together because they’re expertly layered. Do this by clustering elements together, like the B&W book stack and the gold tray and hand sculpture. 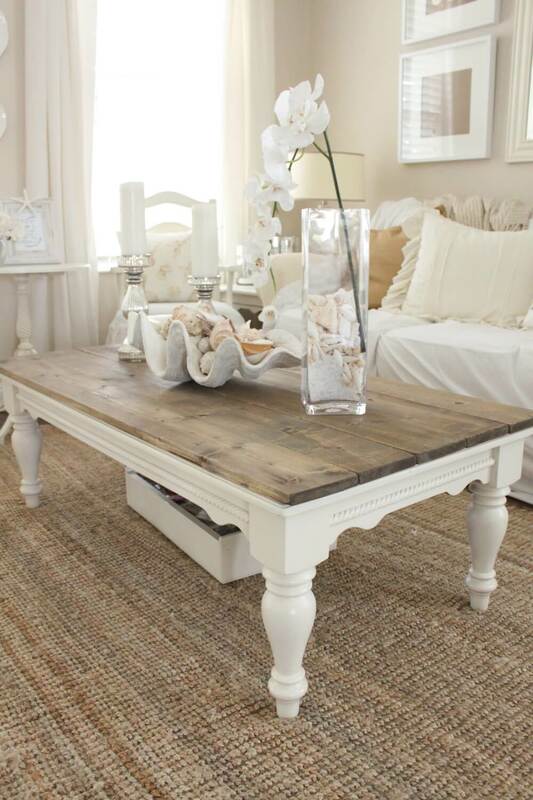 A white-washed wooden table is really beautiful on its own. Adding earth-tone elements like warm metals, greenery, and raffia pull together with stunning perfection. The little birdcage is a neat way to show off live greenery. The oversize weave on the raffia basket makes a traditional element more modern and instantly cleans up clutter. Pink and gold are a beautiful color combination. This coffee table is really amazing. The twisted gold is structural and elegant. The glass top is like a crystal bezel that adds to the gloss. Short stacks of pretty pink books are anchored with accents like pearls and that wonderful magnifying glass. Tall, elegant gold candlesticks and taper candles finish the look. The light, airy ocean environment is perfectly captured in this tabletop arrangement. Using an oversized clamshell instead of a glass or ceramic container is a really nice touch that holds a collection of seashells. Polished silver candlesticks and a tall, elegant glass vase evoke the shimmer of the sun on the ocean waves. The simple white orchid adds some life. 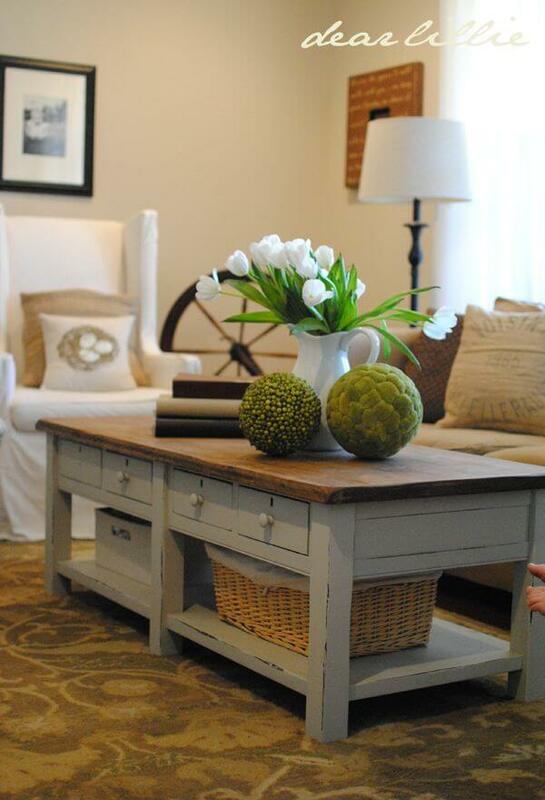 When your overall palette is neutral, you can use your coffee table as a frame to add in color. In this case, the table itself is consistent with the warm neutrals throughout the room. The woven basket keeps the various elements nicely clustered together. Everything adds up to the simple greenery really standing out. 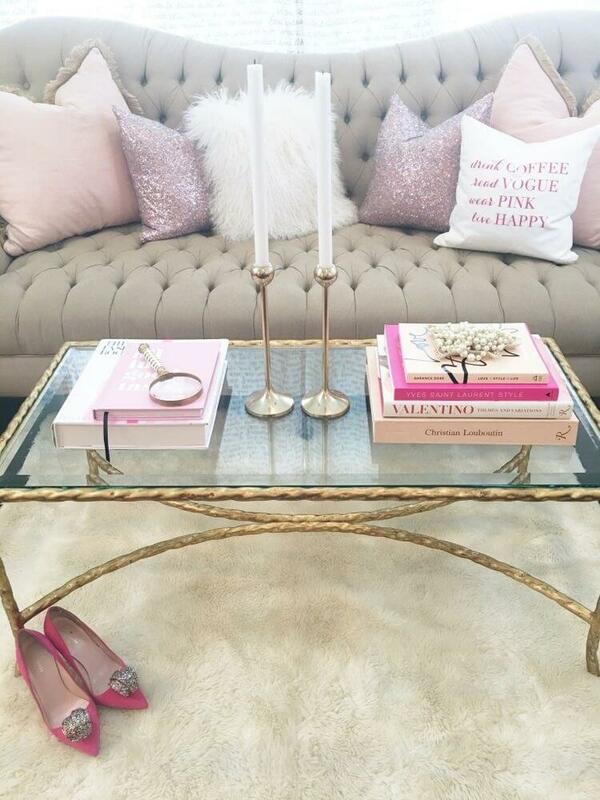 This is a coffee table fit for a diva. First of all: disco balls. A handful of these beauties in a pretty pink bowl is all you need. The gold chainlink starburst is the perfect structural element that manages not to compete with the disco shimmer. Finish with a unique flower vase (with roses, of course) and something in Tiffany blue. 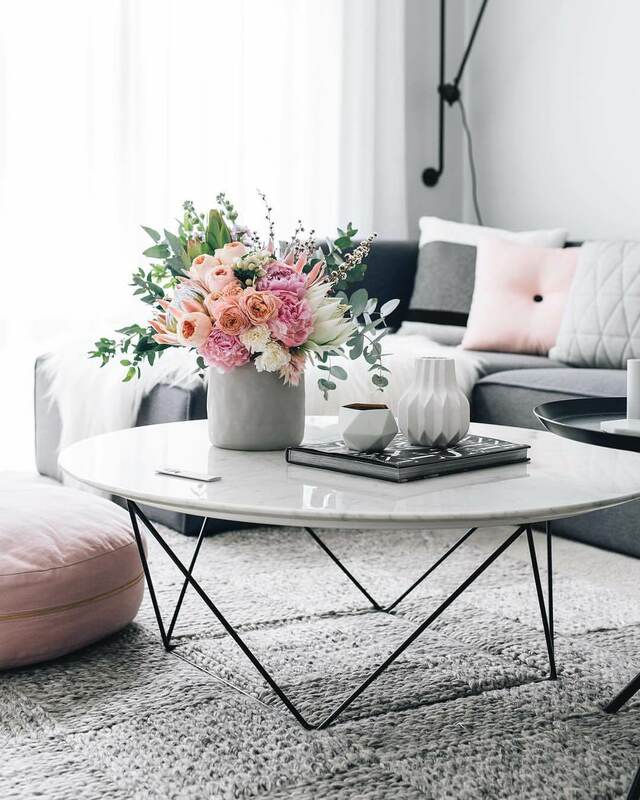 With darker neutrals like the warm chocolate color of this couch, soft contrasts like light pink or turquoise are a nice alternative to brighter colors. 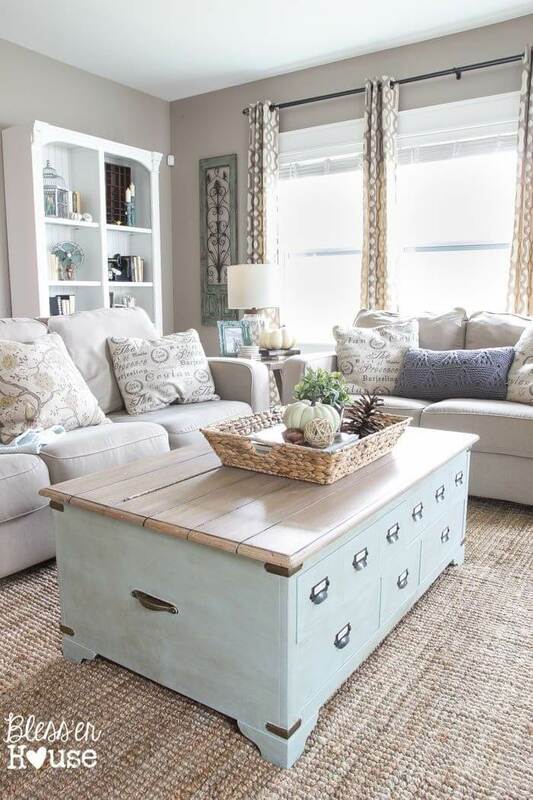 This unfinished wood coffee table has an antique wooden tray which holds a collection of worn books, photos, candle pedestals with floral accents, and a turquoise glass jug with a delicate branch of pink flowers. Simple, natural colors like white and green can be positively glowing alongside warm, woody neutrals. 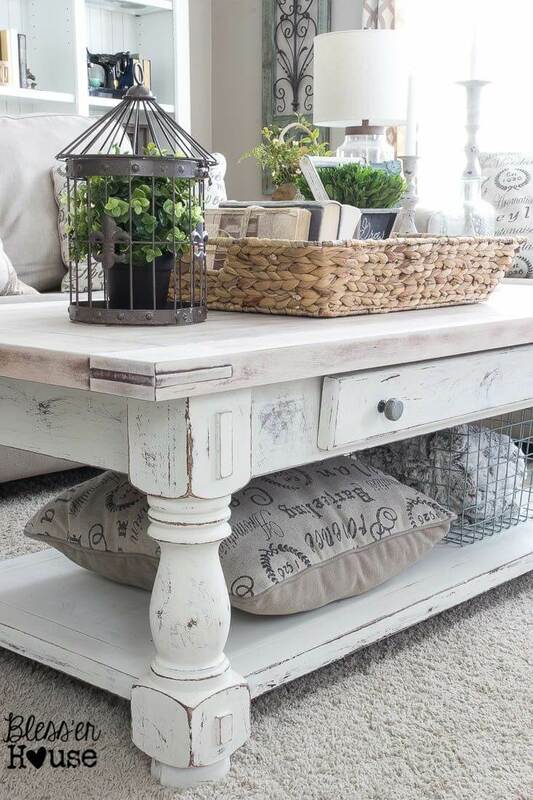 This antique coffee table has simple decor with organizing baskets below and a small stack of books on top. There are two topiary spheres with unique textures, and an antique ceramic pitcher is used as a vase for a bouquet of fresh, crisp white tulips. Isn’t this cozy?! 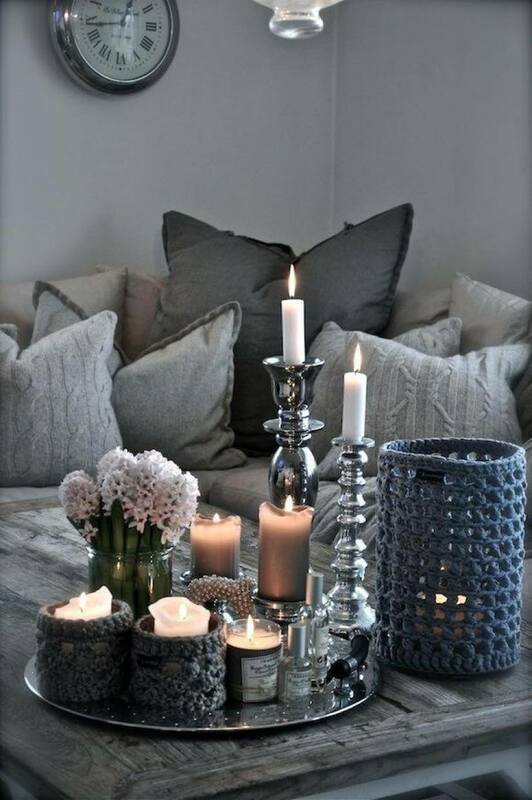 Between the candles and the knitted elements, it’s super inviting and feels very warm. There’s a splash of eclectic glam with mismatched polished silver candlesticks arranged with the candles on the mirror-like platter. 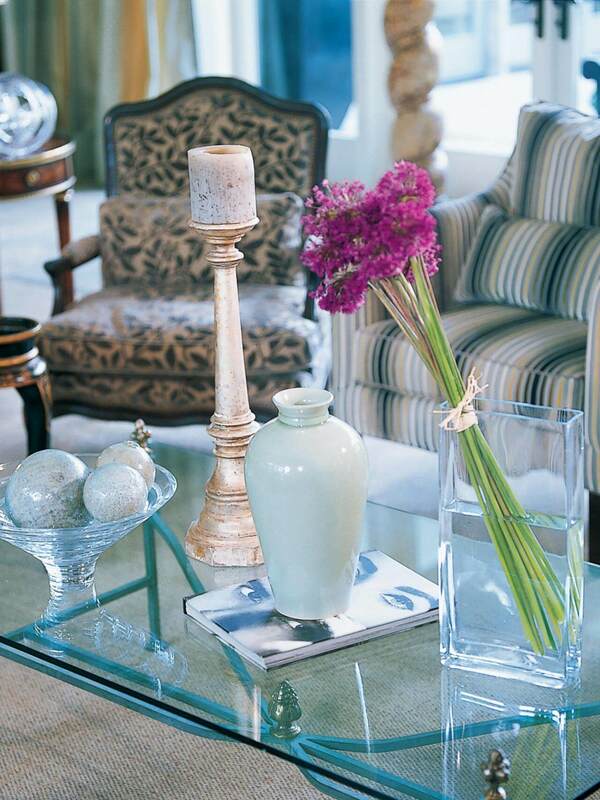 The modern glass vase with a dense, simple bouquet adds more life and fragrance to the space. A wonderful blend of industrial and natural elements come together making this space really unique. The coffee tables themselves are set on black geometric wireframes with thick, heavy tops that create stability. White modernist candlesticks are arranged on the smaller table, while the larger tables hold larger items including a large jug vase, an antler, and a wire-wrapped candleholder. I’ll have two, please! Macarons and Jordan almonds are a surefire way to please your guests. Warm, inviting lighting doesn’t hurt either. Clear glass and acetate are often used to modernize more traditional spaces, and this is a great example. 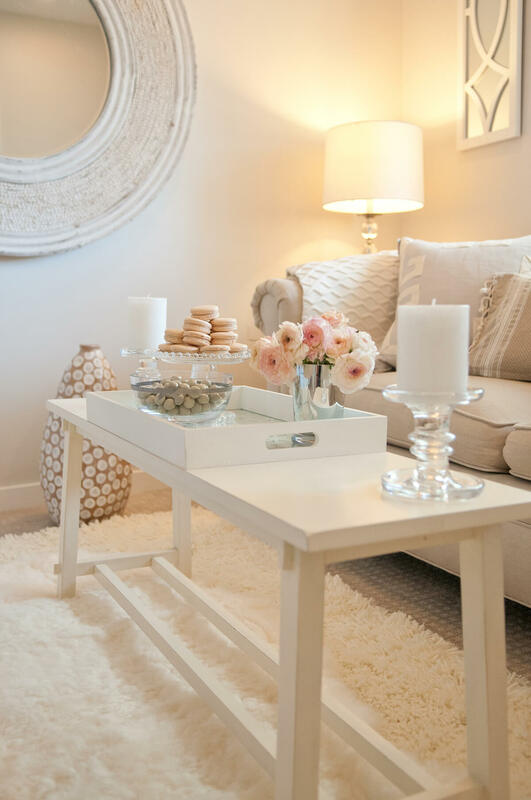 The glass candle pillars, cake tray, and candy bowl add structure but let you focus on the pretty pastel elements. Tribal, retro, and southwestern? Sign us up! 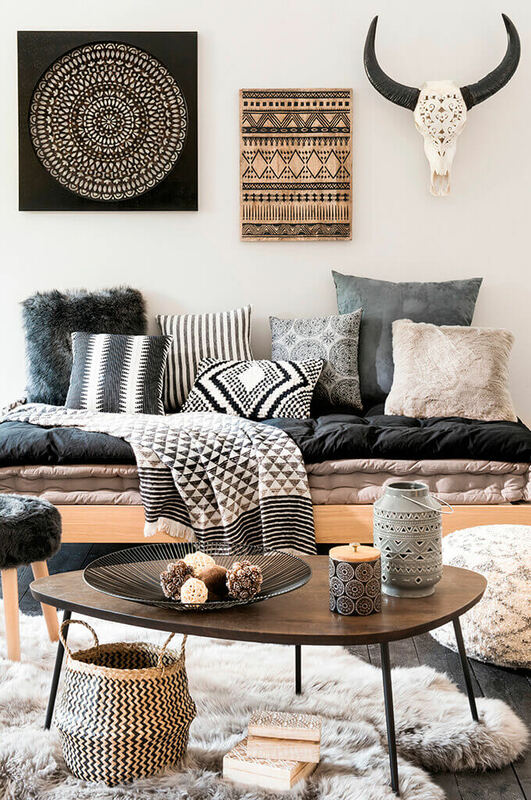 This wild (literally) and diverse grouping is all tied together through a simple neutral palette. The retro-shaped table is chic and minimalist. That spectacular wire basket is a work of art that holds a few simple organic decorative elements. Finally, an oversized tribal print candle and ceramic jug finish off the collection. If your living room is plagued by a sea of toys, work stuff, or other miscellany floating about, you need a coffee table with storage. Guaranteed all those drawers are filled with stuff, but you’d never know because it looks so beautiful and buttoned up! 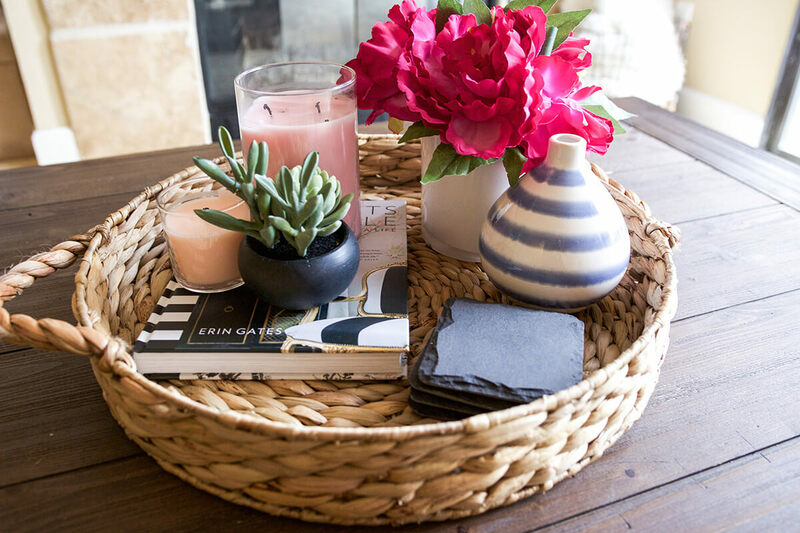 The simple woven basket and botanical accents are all you need to pull everything together. 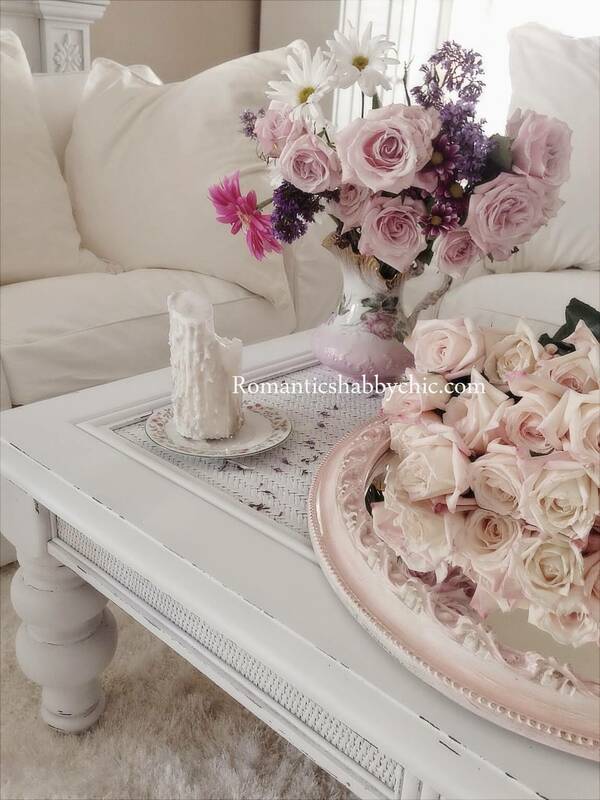 Classic, timeless elegance never go out of style, and neither will this coffee table arrangement. A mirror top table lets you see every angle of the items on it, so make them nice! Attractive books, that gorgeous cutout metal vase and plush bouquet, and a polished silver bowl of shells are perfect choices. 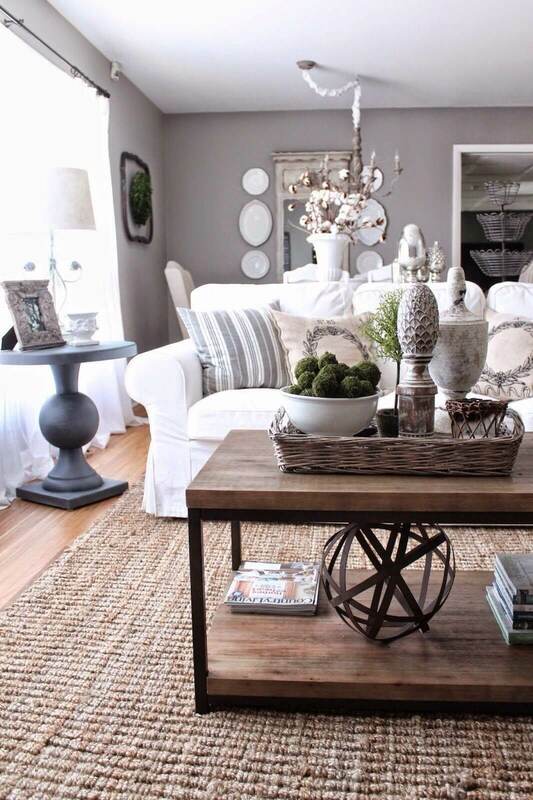 A muted color palette always looks polished here. The shabby-chic decor is begging for fresh flowers to compliment all of the dainty floral patterns on textiles and ceramics, so don’t be shy. Using a teacup holder as a base for a yummy candle is super cute. The rose-colored framed mirror is used as a platter for that gorgeous bouquet, and the floral pitcher holds a second burst of flowers. OMG, Y’all. Copper. 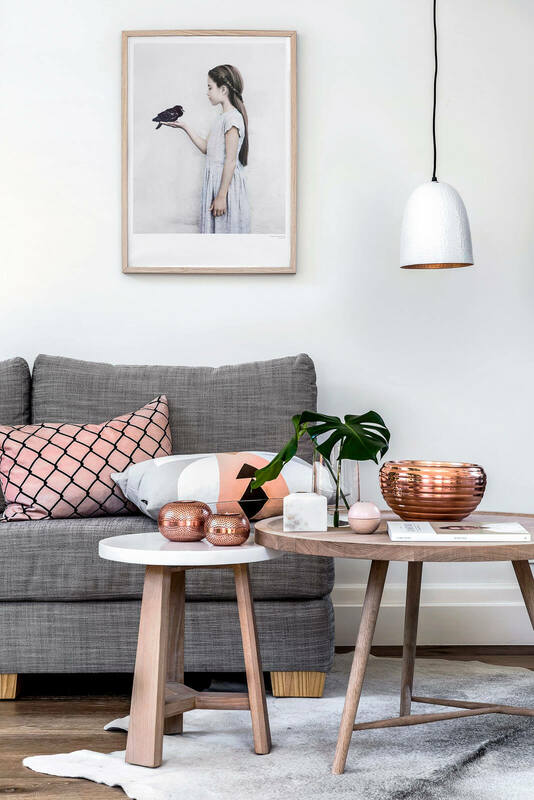 It’s bright, neutral, and metallic all rolled into one, and it makes this stark minimalism glow by pulling out the color in the accent pillows and even the warm undertones of the wood. Keep everything else simple: glass vase with greenery, marble candle holder, white book. A little copper goes a long way! This is a study in texture. Every piece is either clear or in the same palette of cream, but their unique textures make the arrangement full and interesting. The ceramic vessel with a floral cutout is quaint and country, the decorative spheres in glass and sequins are wonderful, and the tray with its crackle pattern and candles is luxe. There are so many ways that minimalist and traditional decor can intersect, and this is one of our faves! 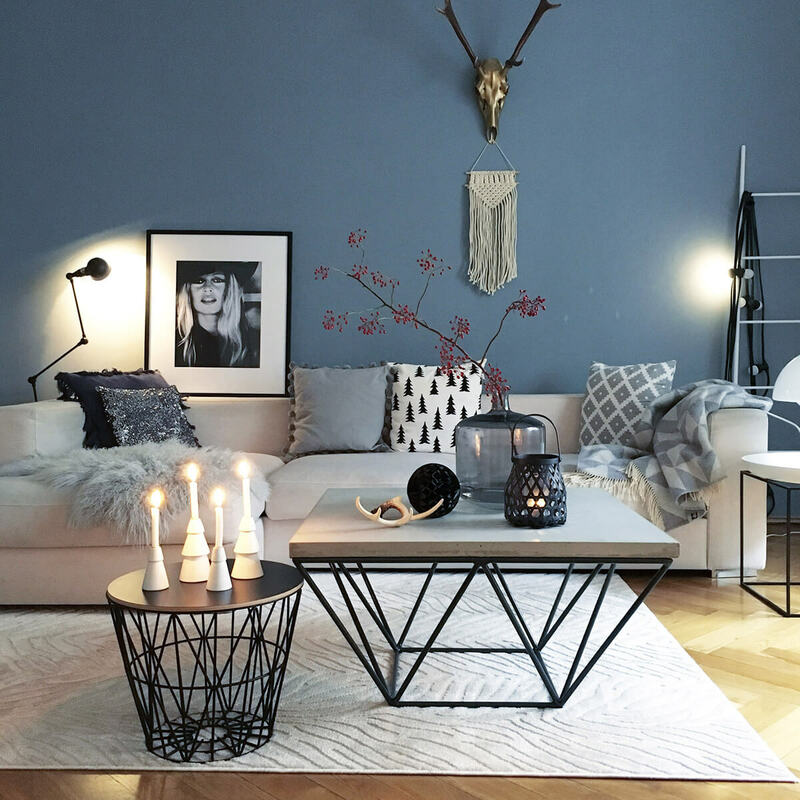 Gray is a beautiful (and surprisingly warm) decorating palette. The antique silver trays pull the styles together with color, and the warm burlap, wood, glass and ceramic items, plus that unique bouquet, really create a focal point. Crisp, structural gold, white, and glass are such a stunning combo. Do you see all of the subtle glass and crystal elements like the ampersand, pineapple lamp, rose terrarium, the tabletop? So subtle, yet the complete the ensemble. 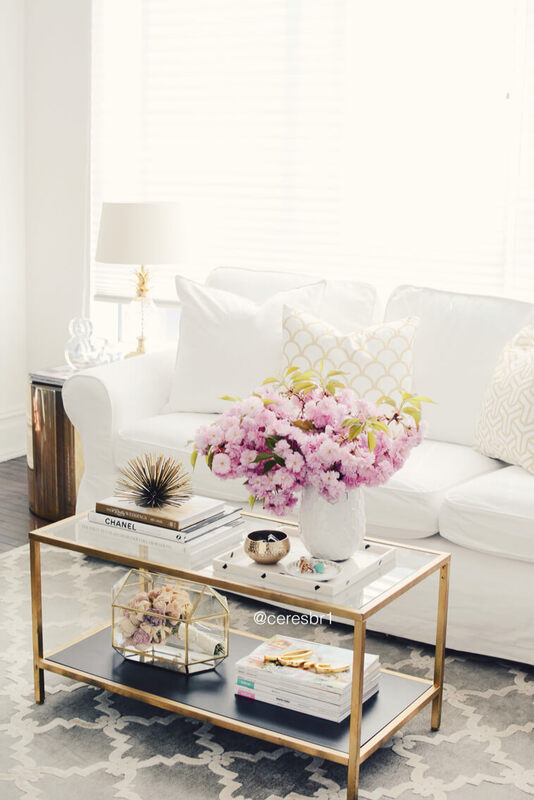 White or marbled elements like the vase and tray always go well with gold. And check out that golden sea urchin paperweight! 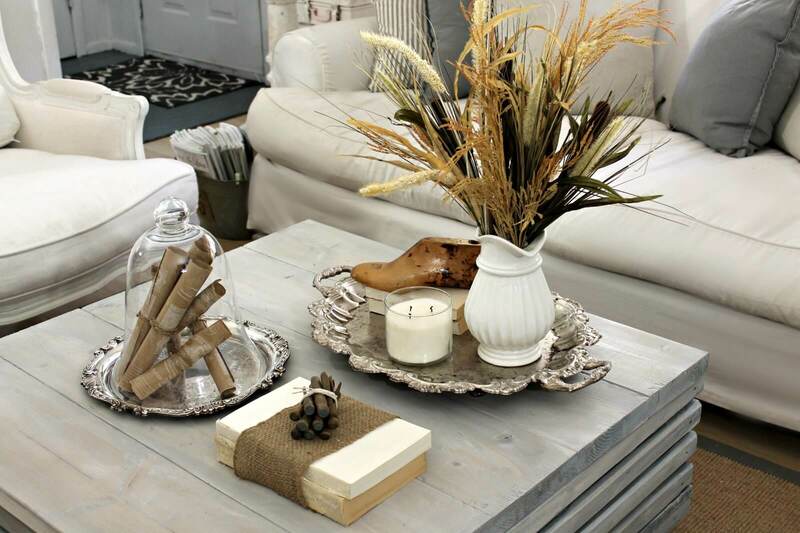 Who says your coffee table decor has to go on top of the table? When you have a collection of unique items like these seashells and stars, this is a really neat idea. You have to find a table that’s made for internal display and keep the items on top simple and consistent so it doesn’t look cluttered. 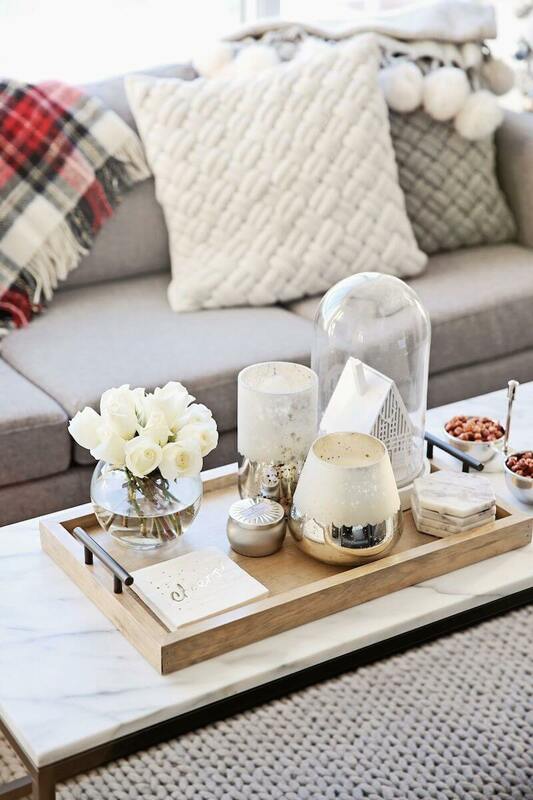 When you have a barely there coffee table like this, continuing the look with minimalist glass vessels and a few key accents is stunning. The cone-shaped bowl that holds the glass globes is a unique shape that looks like an extension of the table itself. A big bold candle pillar is just right, and bright standout flowers finish the collection. Modular coffee tables are wonderful because they’re so versatile. They can turn into side tables in a snap, so your decor should look good whether the tables are together or apart. This kitschy, eclectic collection is perfect for a few bright books, unique ceramics, and a muted neon tray holding the white ceramic candlesticks and vase. Plus flowers, obvi! 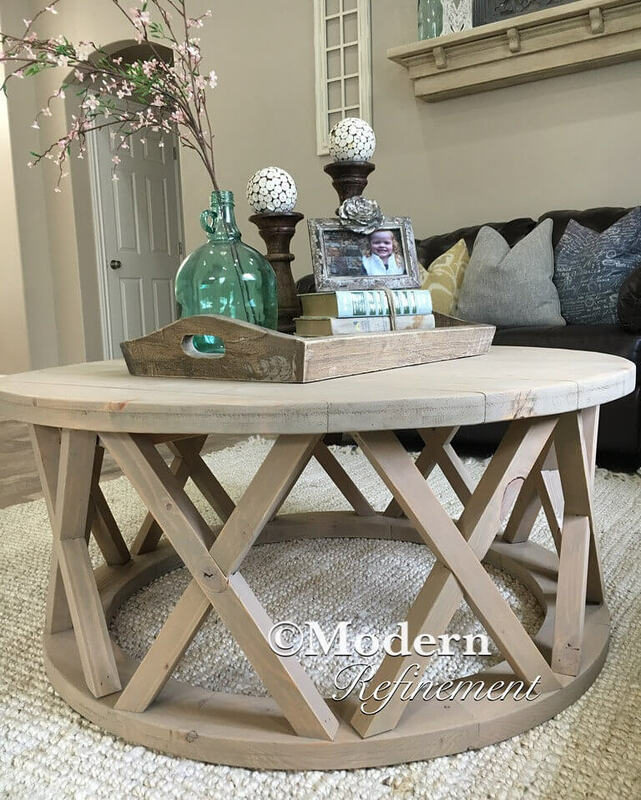 This table is a work of art itself, with crisp edges and a modern finish set off by that signature traditional crown molding shape. Crystal is the perfect way to add intrigue without taking away from the table, hence the crystal bell jar candle holder, orb, and faceted cones. a couple books and a simple vase round it all out. Honestly, if it weren’t for that table you wouldn’t be able to tell if this photo was black and white! That’s the power of a well-chosen coffee table. The raw wood and unfinished edges have a lot to say, so a few simple books and a wire-framed terrarium with a succulent are all you really need. 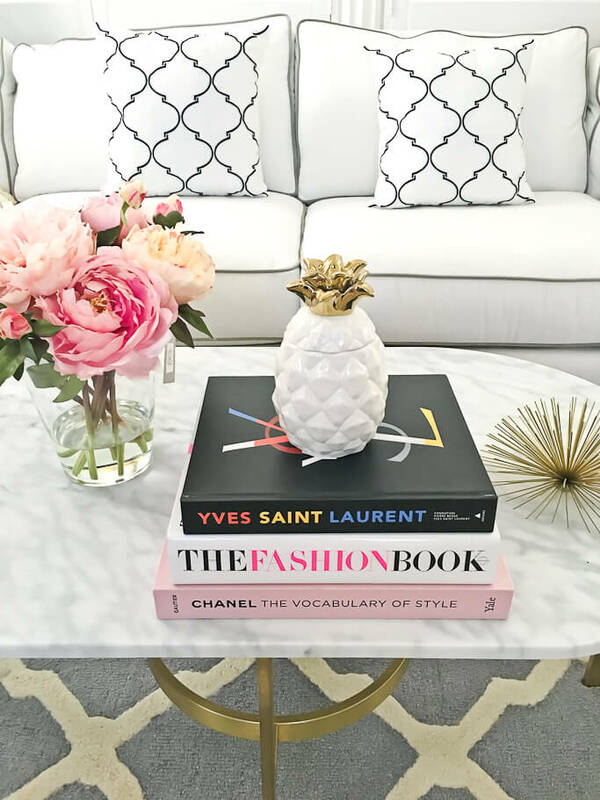 Sometimes you just know that a bunch of stuff (drinks, feet, books, gifts…) is going to wind up on top of your coffee table, so simple elegance is the way to go! This pretty wooden table has three large carved candlesticks holding pillar candles. Follow the “rule of 3” for simple groupings like these candles and you’ll never go wrong. Marble and gold is a combination we’re seeing more and more, and it’s awesome. This table has a pretty gold base and light marbled top which basically begs for those fashion books. White ceramics like the pineapple are a perfect compliment, and the gold burst is a nice touch. Don’t forget flowers! A simple crystal vase is all you need. If you have an eclectic style, and/or lots of colors, acrylic is a wonderful “there but not there” solution. You’ve got those beautiful vibrant books, curio, and flowers. A heavy or dark coffee table would make the whole scene look really busy. Clear acrylic structures all of the items without “being seen.” It’s the ultimate minimalism and it works perfectly here. These elements are whimsical and grounded all at once. The antique table is painted a cheery light shade of turquoise, but it’s weathered edges show its character. 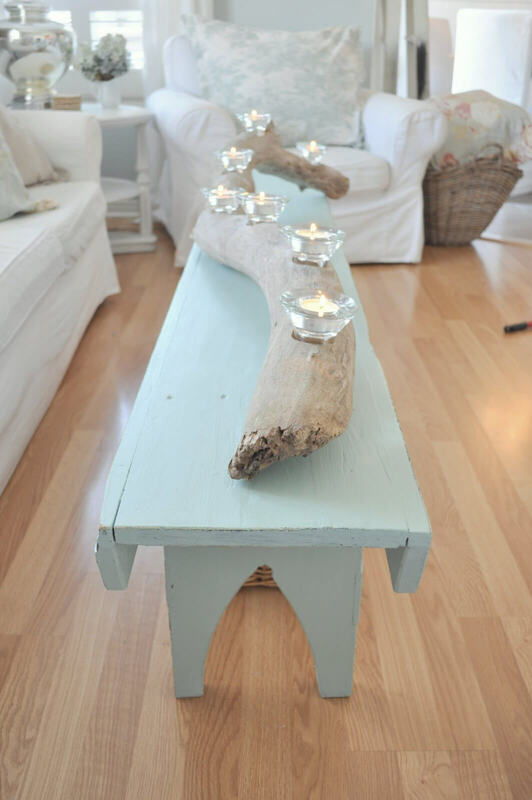 Driftwood is a gorgeous way to bring the outside in, and repurposing it as a votive holder is genius! This is a perfect light, natural arrangement for a coastal home. This living room got “modern traditional” just right! 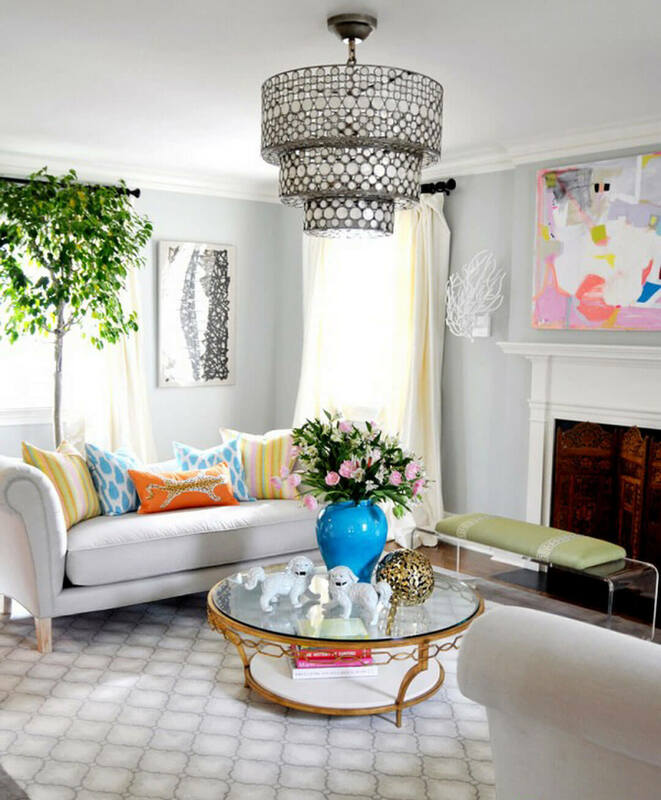 Traditional decor schemes can feel dark, heavy and full, but when you lighten up and minimize the clutter you’re left with something really fresh. 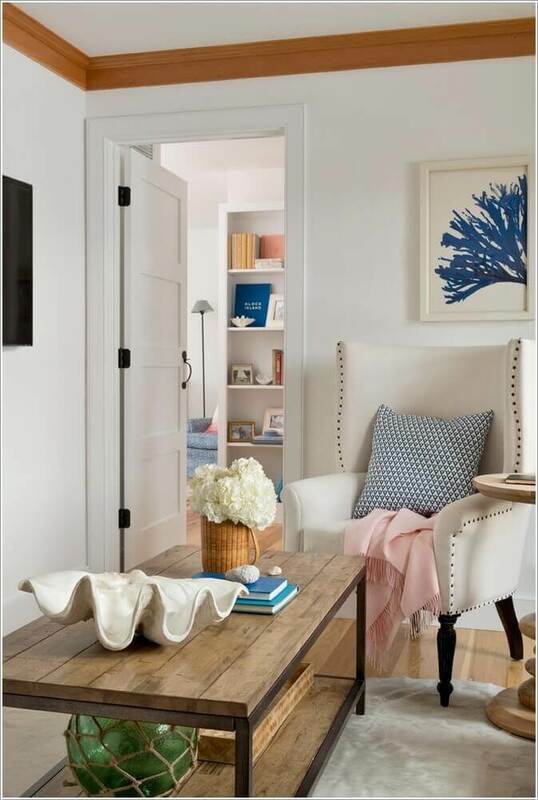 The chair in this room is traditional, the table has traditional elements but more modern lines, and the bright blues and nautical elements pull it all together. 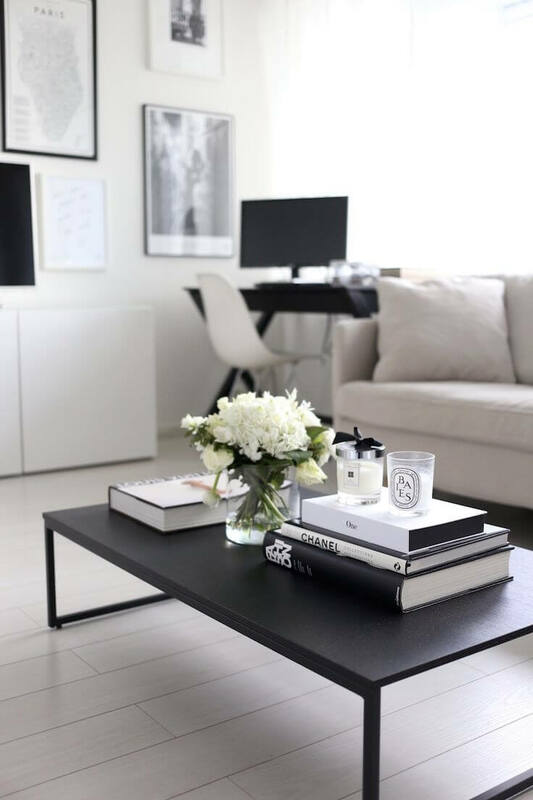 Nothing makes a black and white color scheme instantly warm up like flowers and candles. This arrangement is proof that you don’t even need color to achieve the effect. 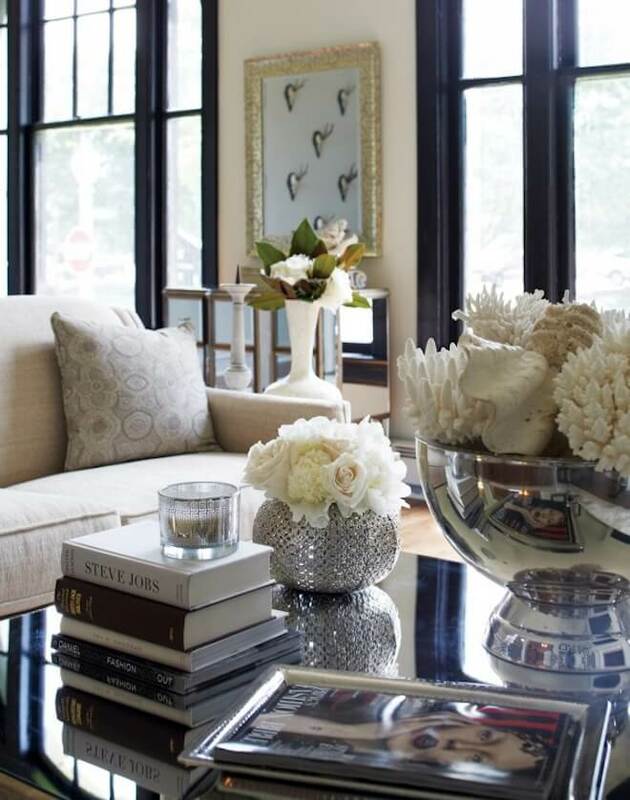 A simple black table, B&W books, a couple of candles, and a smooth crystal vase with white flowers gets the job done! This heavy iron and wood table and it’s unique collection of antlers, glass, wood and other elements invite a curiosity about the books they frame, enticing you to open one up! Everything is in that woody, natural brown palette except for that amazing oversized glass vessel where the candle is settled into beige pebbles. Here’s another iron and wood coffee table, but with a very different vibe. The vibrant green topiary spheres are a classic go-to color element. This table also shows off a unique horse sculpture as a book weight and an antiqued glass candleholder. The tiny glass box framed with dark metal is another interesting accent piece that draws in the eye. Wood + marble + glass = gorgeous every time. We love how the gold dipped candle holders reflect light the same way the round vase filled with water does. There’s a really nice symmetry there. A bell jar is a classy way to show off a focal point, and everything is neat and structured in the simple wooden tray. Isn’t this just delicious? Between that amazing light fixture, the trim on the coffee table, and the mottled gold ball, the metallic elements in this room add most of its texture. The smooth ceramic Chinese lion statuettes and cerulean flower vase give a beautiful contrast. The large oval-shaped floral arrangement perfectly balances the tree in the back of the room. Oversized woven baskets are so stunning and work with all kinds of decor schemes. This one holds everything your coffee table needs: granite coasters, candles, a good book, and charming vases. The granite elements are a really unique natural touch. Succulents are a fabulous low-maintenance greenery for your table, and you can mix it up with bright fresh flowers.